Green Peridot Leaf Trio Sterling Silver Multi-Stone Ring, "Sparkling Leaf Trio"
Resembling the allure of a leafy trio, this ring is created by Babun Dey. 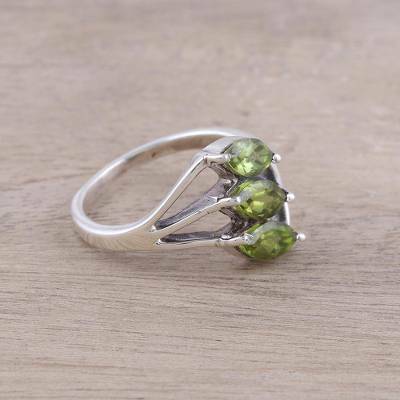 Three sparkling peridot gemstones pose in the center, stemming from a sleek sterling silver band. Peridot is considered a is a warm, friendly, happy stone. Love this ring,wearing it now.Has a good weight,color,design is inspired and cheerful.Thank you Babun Dey. Buying another today as a gift.